Most patients with HR+ breast cancer become resistant to hormonal therapies over time and inhibiting CDK4/6 has been identified as a target for overcoming or delaying resistance to hormonal therapy in advanced HR+/HER2-breast cancer. The prospective, randomised phase 3 PALOMA-3 trial showed that the first-in-class CDK 4/6 inhibitor palbociclib in combination with fulvestrant significantly improved progression-free survival (PFS) in 521 women with HR+/HER2- metastatic breast cancer that had progressed on previous hormonal therapy (2). The new analysis assessed overall survival (OS), a key secondary endpoint of PALOMA-3, after a median follow-up of 44.8 months in 521 patients with HR+/HER2- advanced breast cancer. The patients had relapsed or progressed on prior endocrine therapy before being randomised to palbociclib (125mg/day orally, schedule 3/1) plus fulvestrant (500mg per standard of care) or placebo plus fulvestrant. Researchers carried out the OS analysis when approximately 60% (n?310) of the 521 patients in the study had died. "Here, we present the first-ever overall survival results from a phase 3 study for a CDK4/6 inhibitor in a pre-planned analysis of the PALOMA-3 trial. Importantly, this is the first report demonstrating that the absolute gain in survival is similar to the absolute gain in progression-free survival in the whole population. Moreover, this prolongation of life is of a large magnitude in patients with prior sensitivity to endocrine therapy, "said lead author Massimo Cristofanilli, Professor of Medicine, Robert H. Lurie Comprehensive Cancer Center of Northwestern University, Feinberg School of Medicine, Chicago, USA. "This is very important for patients, as it shows that the improvement in PFS observed in previous studies may have a positive impact on overall survival, an ultimate goal of treatment, therefore improving the chance for a long-term life in spite of advanced disease," said Cristofanilli. He added: "The demonstration of a positive impact on OS also provides additional confidence to clinicians and patients as to the benefits of this combination as an appropriate and effective treatment approach." Commenting on the findings for ESMO, Dr Carmen Criscitiello, European Institute of Oncology Milan, Italy, said: "These data were much awaited, as the clinical benefit obtained with CDK 4/6 inhibitors was incontestable, but there was the hot question whether the PFS benefit translates into OS benefit. This randomised Phase III trial shows for the first time an improvement in OS with a CDK4/6 inhibitor in the metastatic setting for ER+/HER2- breast cancer." However, she added: "The study was unpowered for OS so the data should be cautiously interpreted. Although the results strongly suggest that the PFS benefit may translate into OS benefit, the other trials conducted with CDK4/6 inhibitors will contribute to confirm the estimate of the OS benefit observed in this study." Dr Matteo Lambertini, ESMO fellow at the Institut Jules Bordet, Brussels, Belgium, agreed: "Collecting mature OS data at longer follow-up from randomised trials that investigated the combination of endocrine therapy and CDK 4/6 inhibitors is crucial to have a clearer understanding on the benefit of these expensive agents. The limited OS data that we had so far from these trials are now supported by the PALOMA-3 updated results, which strongly suggest that this treatment should become widely available for women with advanced HR+/HER2- disease." He said: "Further research is needed to better understand how to optimise the sequencing of the available treatment options in this setting as well as to identify patients who may benefit from endocrine therapy alone." Looking to the future, Cristofanilli said: "The significant impact of CDK 4/6 inhibitors on disease-free and overall survival in metastatic disease lead us to be excited about the potential of this class of agents in early-stage breast cancer, where our goal is to improve the cure rate. On that front, two large randomised adjuvant trials of palbociclib in early stage breast cancer, PENELOPE-B and PALLAS, are ongoing." Methods: HR+/HER2- ABC (N=521) patients (pts) who had relapsed or progressed on prior ET were randomized 2:1 to PAL (125 mg/d orally, schedule 3/1) + FUL (500 mg per standard of care) or PBO+FUL. Primary endpoint was investigator-assessed PFS. A key secondary endpoint was OS. OS analysis occurred when approximately 60% (n?310) of the 521 pts died. 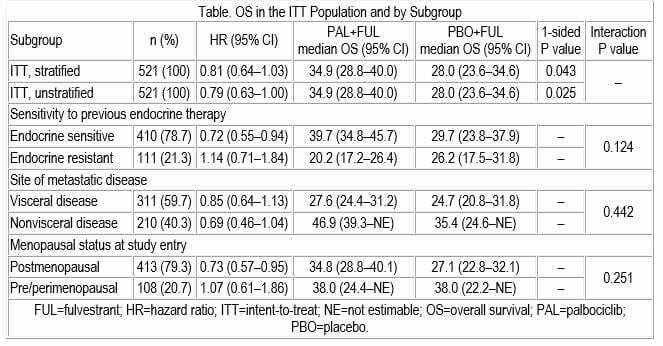 Conclusions: In HR+/HER2- ABC pts, PAL+FUL showed a clinically meaningful improvement in OS (6.9 mo vs PBO+FUL), especially in pts with sensitivity to prior ET. The absolute difference of PFS gain was maintained in OS. Funding: Pfizer (NCT01942135). Disclosure:	M. Cristofanilli: Honoraria: Pfizer. D.J. Slamon: Consulting or advisory role: Bayer, Eli Lilly, Novartis, BioMarin. S-A. Im: Consulting or advisory role: AstraZeneca, Hanmi Corp., Novartis, Roche, Pfizer. N. Masuda: Honoraria: Chugai, AstraZeneca, Pfizer, Takeda; Research funds: Chugai, AstraZeneca, Kyowa-Kirin, MSD, Novartis, Pfizer, Eli Lilly, Daiichi-Sankyo. A. DeMichele: Consulting or advisory role: Pfizer, Novartis; Research funds: Pfizer, Novartis, Johnson & Johnson, Calithera, Incyte, Genentech. S. Loi: Research funds: Merck, Novartis, Roche-Genentech. S. Verma: Consulting or advisory role: Pfizer, Novartis, Roche, Astra Zeneca, Amgen, Eli Lilly. H. Iwata: Honoraria: AstraZeneca, Chugai, Eisai, Novartis; Consulting or advisory role: Chugai, Daiichi-Sankyo. N. Harbeck: Honoraria: Lilly, Novartis, Pfizer. S. Loibl: Research funds: Pfizer, Novartis. F. André: Research funds: AstraZeneca, Novartis, Pfizer, Eli Lilly. K. Puyana Theall, X. Huang, C. Huang Bartlett: Pfizer employee and shareholder. C. Giorgetti: Consulting role: Pfizer; Shareholder: Pfizer. N.C. Turner: Honoraria: Pfizer; Consulting or advisory role: Pfizer; Research funds: Servier, Pfizer, Eli Lilly, Roche, AstraZeneca.